According to the Great One, it has probably been more than a decade since she stepped foot in Taiwan - outside of Taoyuan International Airport, that is. She had been asking me to take her around Taiwan for a few years, and she's finally decided to grace my homeland with her presence. Since she's flying into Taoyuan anyway, we decided to start her tour in Taichung with a meal at the highest-ranked restaurant from Taiwan on the Asia's 50 Best Restaurants list - Le Moût. After getting off the high speed rail, I took our group to National Taiwan Museum of Fine Arts (國立台灣美術館). It's close to the restaurant, and they happen to be holding an exhibition of Japanese ukiyo-e (浮世絵) art in conjunction with the Tokyo Fuji Art Museum (東京富士美術館). It was a rare chance to see some legendary prints from the era, such as 31 of the Fifty-three Stations of the Tokaido (東海道五十三次) from Utakawa Hiroshige (歌川広重) and 17 of the Thirty-six views of Mount Fuji (富嶽三十六景) from Katsushika Hokusai (葛飾北斎). With some time to kill before our early dinner, we stopped by L'atelier de Bon Pain next to the museum. This actually turned out to be a decent bakery opened by someone who had won some kind of prize at Mondial du Pain 2011. We sampled a few of their selections, including kouign amann, canelé, gâteau breton... which weren't bad at all. Finally it was 6pm and we walked through the gates of Le Moût to meet up with HaoKouFu. After spending a few minutes making sure we were dressed for dinner, we were seated at our corner table while the sun was still out. 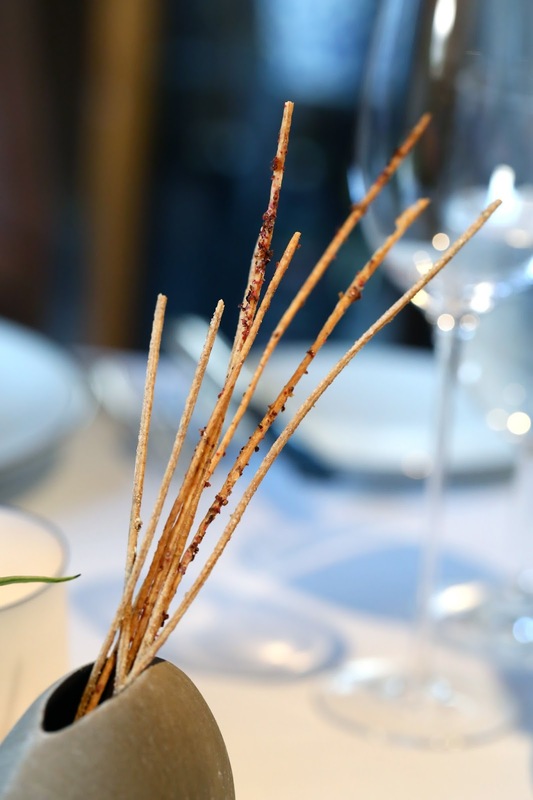 These dough sticks were placed in front of us as snacks, which were like crunchy angel hair pasta with spices. Here we go again... the butter that I had so much issue with on my last visit. Once again they had been left sitting at room temperature too long, but at least this time it wasn't as soft, and didn't taste disgusting like it had gone off. Both the salted and seaweed butter tasted fine. Aperitif - there were a trio of bite-size snacks. Filo stuffed with clam and cream - this was very creamy, with some dill in the mixture. The chopped clams inside provided a nice, springy texture in the midst of a creamy pile. I think we were told there was a little Crème de Menthe inside? Pastry puff stuffed with char siu - like a char siu pineapple bun (菠蘿叉燒包). There were definitely bits of char siu here, and the green sauce inside reminded us of the garlic herb butter we often see with escargots à la Bourguignonne. Pineapple marshmallow - with Sichuan peppercorns (花椒) and little cubes of jamón ibérico. 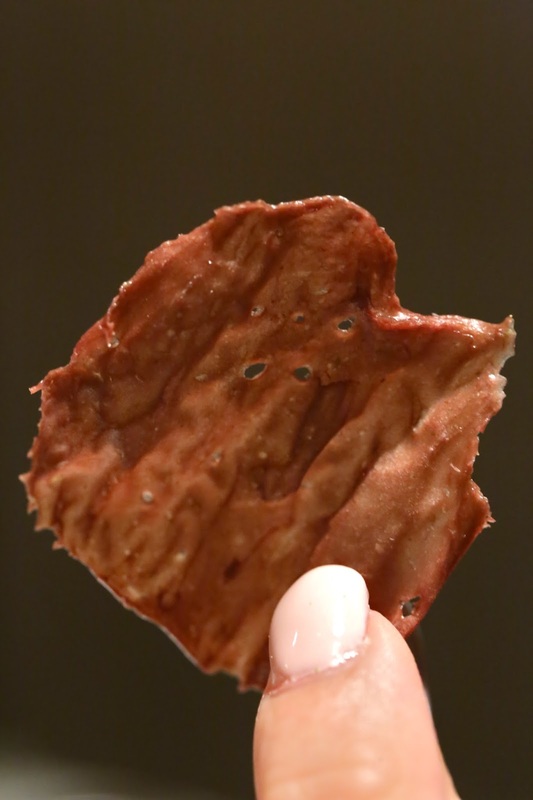 Then came our first piece of bread... made with Taiwanese sausage and Kaoliang (高粱酒). The sausage was chewy, with a nice, smoky flavor. And I could definitely taste the alcohol in the bread. Shiso, sweet shrimp, lemon, herb - I thought the Japanese king prawn was not deep-fried as described but rather lightly torched. The shrimp-flavored tofu was pretty interesting, and the texture was like almond tofu (杏仁豆腐). There was ume shiso (梅紫蘇) powder sprinkled everywhere, including the delicious shrimp consommé. The little shrimp-flavored churros on top were crunchy and tasty, decorated with shiso flowers. The lemon confit added a touch of acidity. For some reason the wax begonia on top made this look Japanese. Very nice. 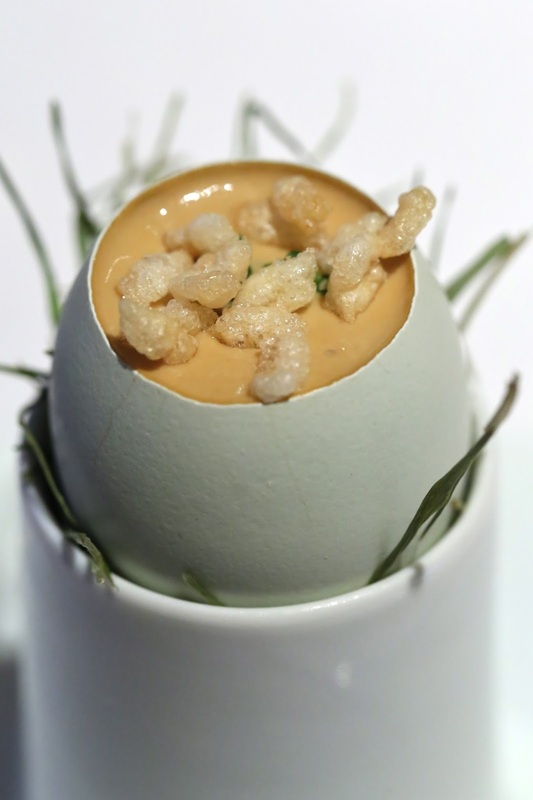 Preserved turnip and silkie hen's egg - this was inspired by the Taiwanese dish of 菜脯蛋. You've got steamed egg custard with sun-dried radish aged for more than 30 years, plus some crunchy pickled radish that seemed a lot more recent, along with puffed rice grains on top. A nice comfort dish, and I liked having the mix of textures from the soft purée and custard, to the aged radish with just a little crunch, to the (newly) pickled radish, and finally to the crispy rice. Very well-thought out. Green bamboo shoot, winter black truffle of Australia, salted pork, white fungus - this "millefeuille" was possibly my favorite dish of the evening. The thin slices of summer bamboo shoots from Yangming Mountain (陽明山) were very sweet and juicy, with clean and refreshing flavors. There were also layers of white fungus, crunchy cabbage, and black truffle. Apparently somewhere in there was also salted pork purée, but I tasted no trace of it. There were, however, crunchy slices of dried salted pork on top, as well as thin discs of what seemed to be white button mushrooms. The "dot" on the side was made with truffle jus, truffle oil, fresh truffle, and Sherry vinegar. A beautiful dish delivering light and refreshing flavors, accented by the intense perfume of black truffles. I think this was everyone's favorite. Our second piece of bread was made with wild honey. It did seem a little sweeter. Charcoal grilled foie gras, blazei mushroom, mango, "pain perdu fumé" - with thin slices of Taiwanese green mangoes and mango sauce. There were also smoky bits of mushroom besides the big halves of blazei mushrooms. The smoked brioche was particularly delicious. The foie itself was actually poached first to deliver a very soft texture. Very nice. Mung bean, agnolotti, mugwort, lamb paper and broth - this was universally panned by the table. The creation looked interesting visually, but the ingredients didn't seem to gel together. There must have been a reason why the chef chose to assemble them in the same dish, and I guess none of us "got" what she was trying to deliver. There were what seemed like bits of crunchy, buttery cookies on the side with white sesame inside. The lamb paper was crunchy and delicious, with cumin that hit our noses before we had taken a bite. The agnolotti were made with mugwort and stuffed with mung bean paste. The wrapper was too thick and chewy, and the mung bean paste was pretty bland. The whole thing just seemed to heavy and unnecessary. But the lamb broth was nice, although I was unable to distinguish the homemade mugwort oil in the broth. Maine lobster, chorizo, green sauce, raspberry - the lobster was cooked "confit" in duck oil and tasted very delicious, with a layer of chimichurri sauce. Chorizo foam on side was a little spicy but good, with some chorizo bits sprinkled on top of the lobster. Sautéed Swiss chard was surprisingly smoky, while fresh and puréed raspberries added a little acidity. Very good. Wagyu flat iron, beef tongue, fig, onion, blackcurrant - Hello Kitty was kind enough to share a little bit of her main course with me. The beef (from Snake River Farms, I believe) was delicious as expected, and came with sautéed beef tongue that was smoky. Served with Shaoxing wine "purée" as well as caramelized onions, figs, and blackcurrant in beef jus on the side. Beggar's chicken, white eel, mushrooms, baby ferns - an interesting interpretation of the classic dish of beggar's chicken (叫化雞). 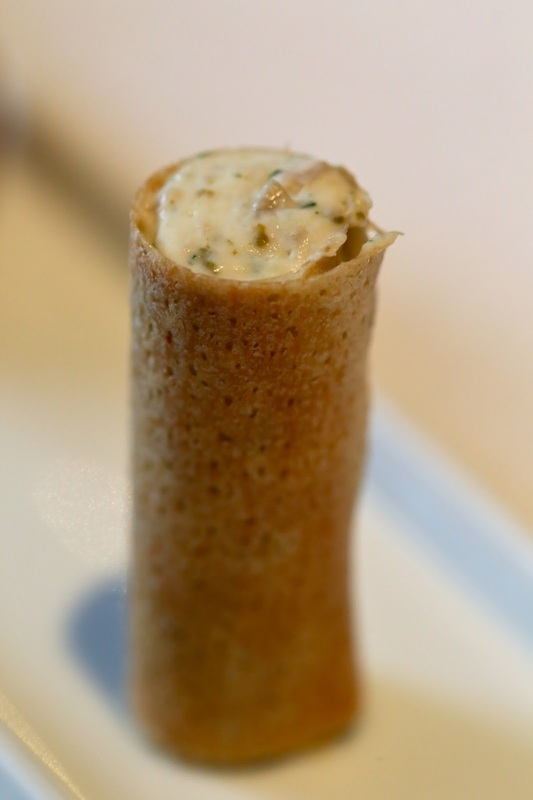 The top half of the "roll" was a mousse of chicken breast mixed with eel - which was included for its muddy flavors, in a gesture to recall the inevitable soil flavors which comes from cooking beggar's chicken in mud. It was also stuffed with mushrooms to impart more earthy flavors. The chicken leg at the bottom of the roll was nice and succulent. Sprinkled on top and on the side was a powder made with sarcodon aspratus - or "tiger paw mushroom "虎掌菌". The garnishes on the side included sautéed yellow turnip and crunchy bird's nest fern (山蘇). Pretty decent chicken. Although I'm not sure that it reminds me of beggar's chicken, at least it was a helluva lot more interesting than the chicken I had here 5 years ago. Camembert, turnip, vanilla, Tieguanyin - I was wondering why the Camembert tasted sweet and a little different... and when we were told that the center was made together with Belgian white chocolate, everything suddenly made sense. The turnip and vanilla foam on the side was kinda interesting, but the "swoosh" made with Tieguanyin (鐵觀音) tea was delish. Nymphéas - this dessert blew us away, and probably would rank either as the best dish of the evening or just below the millefeuille with bamboo shoots. Looking at the name, it's not surprising that this was inspired by Monet's paintings of his waterlily pond at Giverny. Within the bowl was a broth made with Baihao Yinzhen ("white hair silver needle", 白毫銀針) tea. Other ingredients included candied winter melon (冬瓜糖), tofu pudding (豆花), white fungus, wolfberries, lotus seeds, and elderflower sorbet. Everything seemed to work together perfectly. Nothing was too sweet or too sour. You had a variety of textures from the melting sorbet, soft pudding, to slightly crunchier white fungus and finally the lotus seeds. And decorated with nasturtium and wax begonia to look like a waterlily pond. 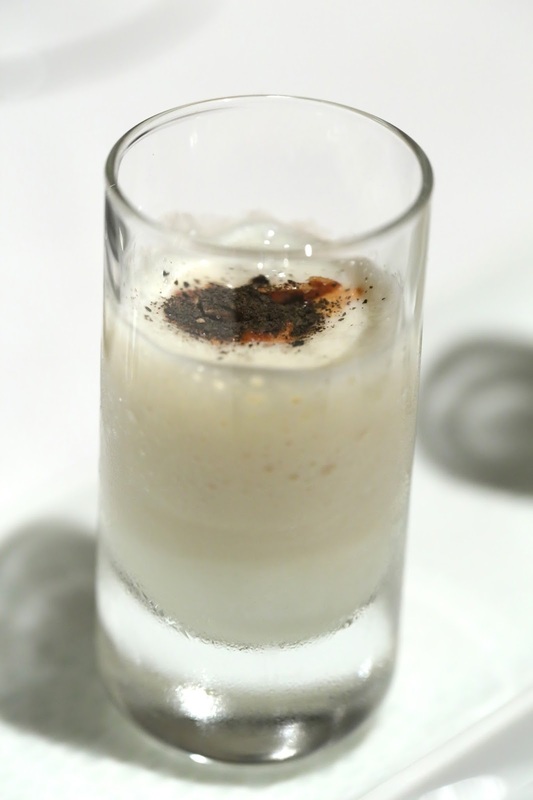 First came a cup with soy milk and almond pudding (杏仁豆腐), with toasty soy powder and toasted almonds on top. Fruit tart - with custard and grilled pineapple, chocolate tuile and spices. The anise flavors were very strong. 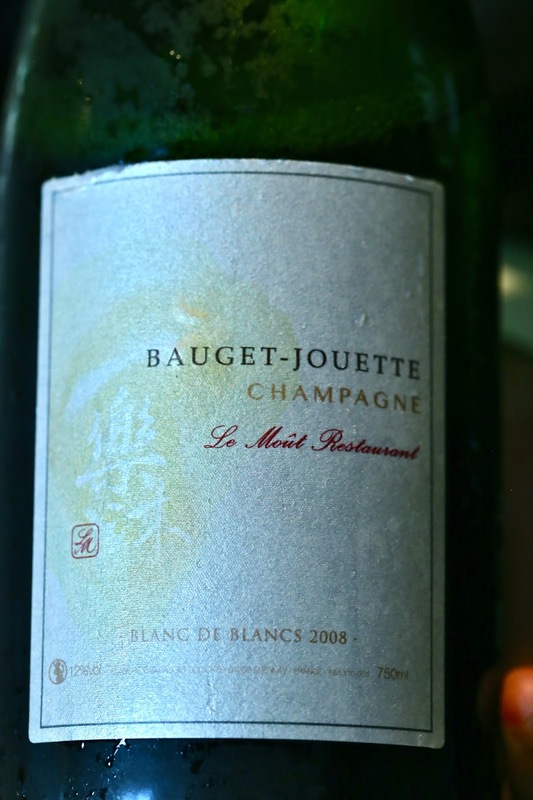 2008 Bauget-Jouette Blanc de Blancs «Le Moût Restaurant» - nice acidity with a little ripeness. Nose was still a little sharp and somewhat toasty. Complimentary glass from the restaurant. 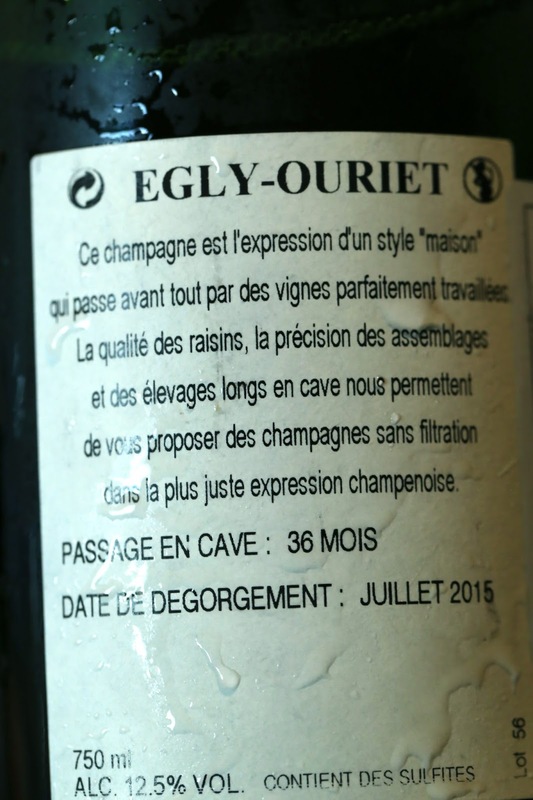 Egly-Ouriet "Les Vignes de Vrigny" Premier Cru, dégorgée en Juillet 2015 - rich and full-bodied on the palate with a long finish. Very interesting and toasty nose, with a bit of caramel. 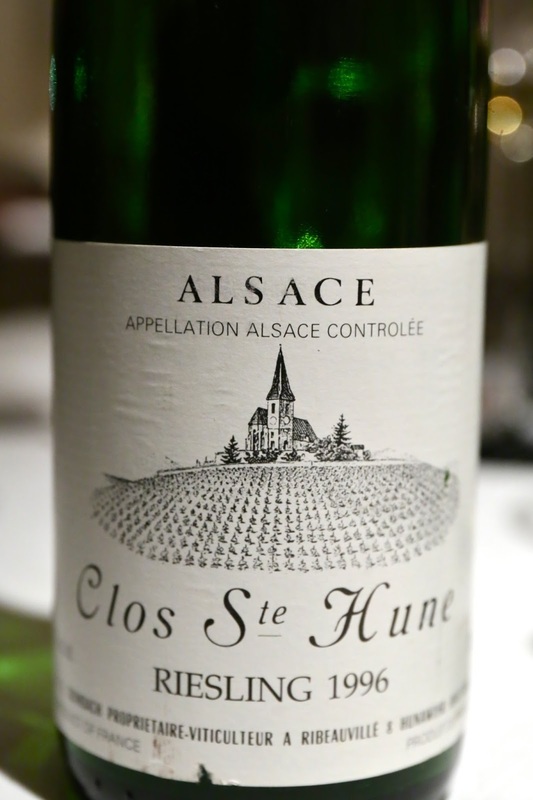 1996 Trimbach Riesling Clos Ste Hune - this was a little more mature than I had expected. Lovely nose with flint, mineral, a little toasty and smoky, along with a little bit of honey. 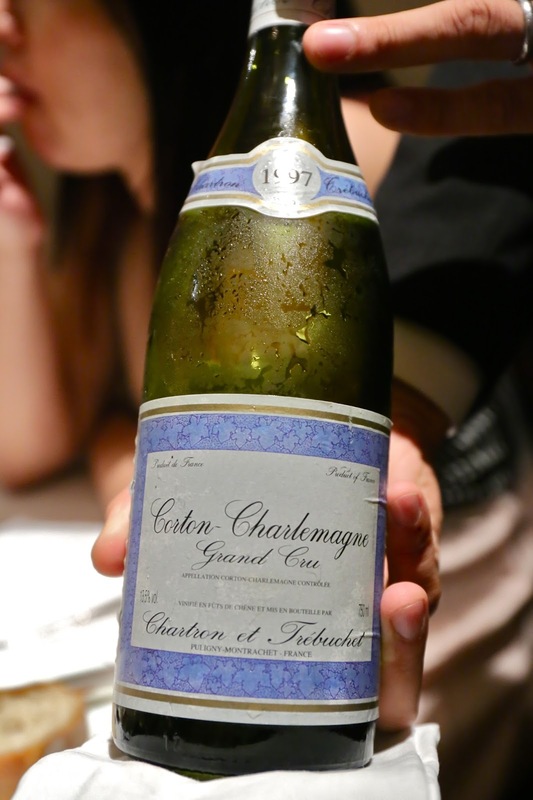 1997 Chartron et Trébuchet Corton-Charlemagne - a little vanilla and almond, buttery, a little sweet on the nose, with tropical pineapple, straw, and Chinese licorice. Complimentary glass from the restaurant. 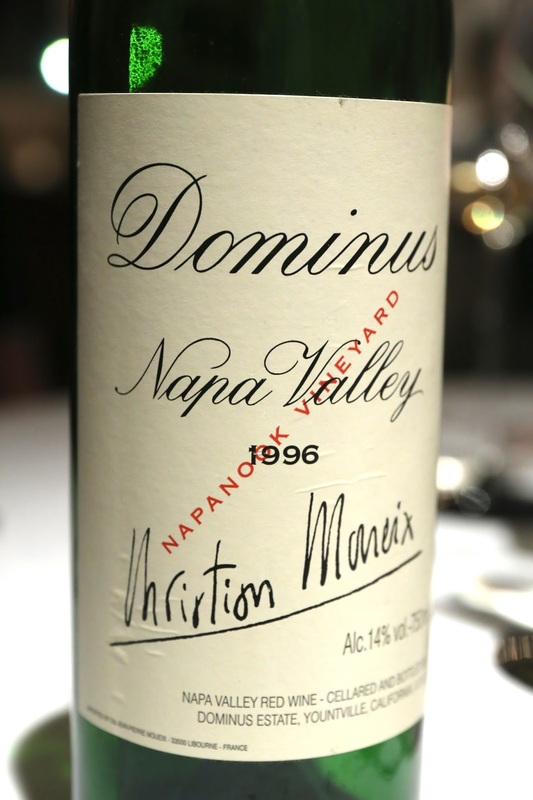 1996 Dominus - very minty, oaky, cedary, and fragrant. Smoky and a little earthy, with a hint of tea. Slightly sweet on the palate. Full-bodied and smooth on the palate. Drinking very, very well right now.